light of this disease and its aftermath. the body to respond to stress. disease on the body are dramatic. range from distressing to demoralizing. unrecognizable to those around you and to yourself. otherwise allowed this to happen to your body. resolve to live your life in a stranger's body. properly diagnosed, is a serious and rare disease. wish it even on our worst enemy. the house or even unload a dishwasher. available to a Cushing's patient. only serve to leave us more isolated and feeling alone. is that we somehow are "doing this to ourselves,"
have that much control over such a terrible disease. for the body to perform correctly its basic systemic functions. Cushing's causes a tearing-down of muscles and bone. But regrettably, this is not possible in every case. have suffered the consequences of long-term hypercortisolism. pharmacy or clean their house. concerned about me, and I appreciate that so much. Endocrinologists (doctors who specialize in Cushing's Syndrome and its related issues) realize the medical aspect and know the damaging effects that Cushing's has on the body. Family and friends see their Cushie suffering and know they are hurting physically and often times mentally and emotionally. However, understanding the debilitation of Cushing's and how it can affect every aspect of a person's life can only be truly realized by those who have experienced the syndrome. 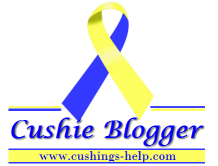 Cushings Help Organization, Inc., a non-profit family of websites maintained by MaryO, a pituitary Cushing's survivor, provides this letter for patients to provide to their family and friends in hopes of providing a better understanding Cushing's and it's many aspects. We're sorry to hear that your family member or friend has Cushing's Syndrome or suspected Cushing's. A person may feel better at times then at other times. It's common for a Cushing's patient to have burst of energy and then all of a sudden they become lethargic and don't feel like moving a muscle. There are many symptoms that are associated with Cushing's. They include weight gain, fatigue, muscle weakness, shortness of breath, feeling achy all over, headaches, blurred vision, mood swings, high blood pressure, stretch marks (straie), buffalo hump, diabetes, edema and the list goes on. Hormones affect every area of the body. It is important to note that not all patients have every symptom. Even some hallmark symptoms, such as straie or the "buffalo hump", may not be noticable on every patient. Not everyone who has Cushing's will experience the same symptoms, treatment, or recovery. Because not all "Cushies" have these symptoms, it makes diagnosis even more difficult. Cushing's can cause the physical appearance change due to weight gain, hair loss, rosacea, acne, etc. This can be very disturbing when looking in the mirror. Changes in appearance can often cause the Cushing's patient to withdraw from family and friends making it a very lonely illness. Patients often feel alone or withdrawn because few others understand. Cushing's can affect affect anyone of any age although it is more commen in women. Cushing's patients need to be able to take one day at time and learn to listen to their bodies. There will most likely be times when naps are needed during the day and often times may not be able to sleep at night due to surges of cortisol. Your Cushie doesn't expect you to understand Cushing's Syndrome completely. They DO need you to be there for them and try to understand to the best of your ability what they feel and not give up on them. Often a Cushing's patient may be moody and say things that they don't mean. If this should happen with your Cushie try not to take it personally and know that it's most likely caused by the elevated cortisol and disturbances in other hormone levels caused by the Cushing's and not from the heart or true feelings of your Cushie. It can be very depressing and frustrating having so many limitations and experience things in life being taken from you. Cushing's patients are sick, not lazy, not hypochondriacs or even the newer term "Cyberchondriacs". If a Cushing's patient says they don't feel like doing something or they express how bad they feel let them know that you believe them. One of the most frustrating things to someone who is sick is to have those you love not believe you or support you. Telling a Cushie to think positive thoughts will not make him/her well and will just be aggrivating. Testing procedures can be lengthy and this can become frustrating for the patient and family. Often, it takes a while for results to come back and this can be stressful. Don't look to far ahead just take one day at a time and deal with the situation that is at hand at the present time. After a diagnosis is made then it's time for treatment. Surgery is usually the best treatment option for Cushing's that is caused by tumors. Don't be surprised if the surgeon's facility wants to run even more tests or redo some of those that have already been done. Your Cushie may have to travel a ways to find a surgeon who is trained in these delicate surgeries and who has performed many of them. Once the diagnosis has been made and treatment has finished then it's time for the recovery process. Not all patients who have surgery are cured and they have to make a choice along with the advice of their doctor as to what their next treatment option will be. The recovery from the surgery itself is similar to any other surgery and will take a while to recover. The recovery process obtained from getting a cure from Cushing's is quiet different from other surgeries. A Cushing's patients body has been exposed to excess cortisol, usually for quite a long time, and has become accustomed it. When the tumor is removed that has been responsible for the excessive cortisol and the body is no longer getting it this causes the body to have withdrawal symptoms. Withdrawal can be very hard causing an array of symptoms muscle aches, weakness, bone and joint pain, emotional disturbances etc. Thank you for reading this and we hope it will help you to understand a little more about Cushing's and the dibilating affect it can have on a person. Thank you for being there and supporting your Cushie during this time in their life. We realize that when a family member has Cushing's it not only affects the individual but other family members and those around them as well. Showing your love and support will encourage a speedy recovery for your Cushie.